If you are outside on a hot day working in the gardening, or taking a walk through a park, you might find a shiny bee resting on your sweaty skin. It is probably a sweat bee! Sweat bees are a large, diverse group of bees in the family Halictidae that are important pollinators of both wild and crop plants. They get their name from their attraction to sweat, which provides moisture and salt for the foraging bees. Many of them have a metallic or shiny sheen, but they come in a variety of colors including all black, black and white striped, gray, green, or blue, and range in size from very small (~0.15 inches in length) to relatively large (over 0.4 inches in length). Other than their typical shiny coloration, they can be identified by short tongues, in contrast to longer-tongued honey bees, bumble bees, and orchid bees, and their thin or slender bodies. With over 1,000 species in North and Central America, and approximately 44 species in Florida alone, sweat bees are some of the most common bees. They also display a diverse range of behaviors. While many of them nest belowground in tunnels, some nest aboveground in rotting wood or plant cavities. They also span the gradient of sociality, including species that are solitary, with no division of reproduction or labor, and species that are eusocial, with well-defined queen and worker castes. Some species exhibit either solitary or social behaviors depending on their environmental conditions! Most sweat bees are generalists, meaning they will visit a variety of plants including crop plants. They are often quite common on farms and thus play a significant role in pollination. 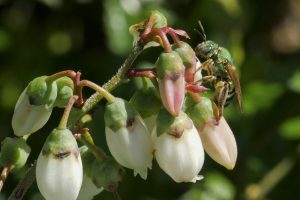 In Florida, some of the more common species include Halictus poeyi, a black and white striped bee, and Agapostemon splendens, a metallic green bee. You can read more about these sweat bees on Featured Creatures.